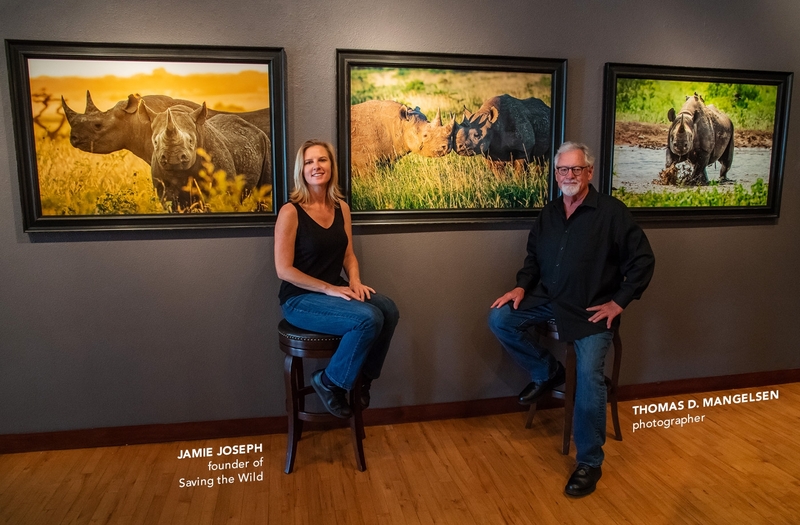 The Saving the Wild Collection includes 16 photographs of elusive and endangered animals, limited to only five editions each. 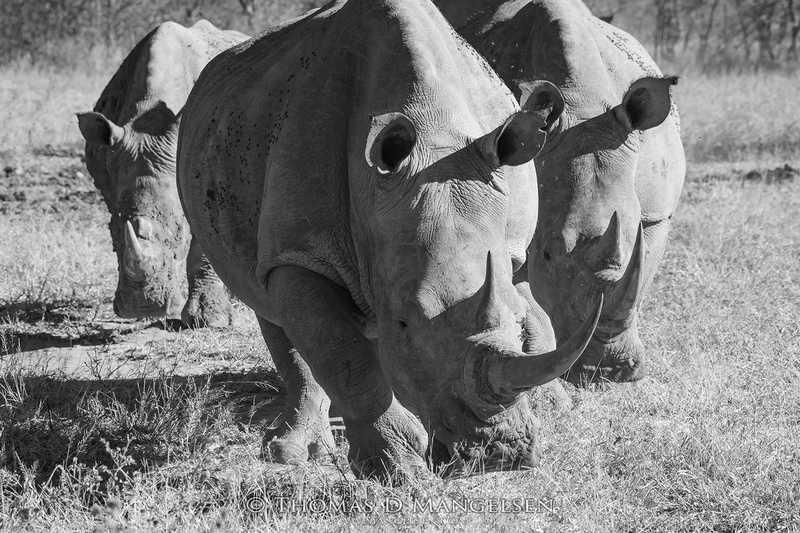 Art collectors now have an opportunity to directly contribute towards the survival of the iconic rhino, with half of all sales being donated to the groundbreaking environmental organization, Saving the Wild. 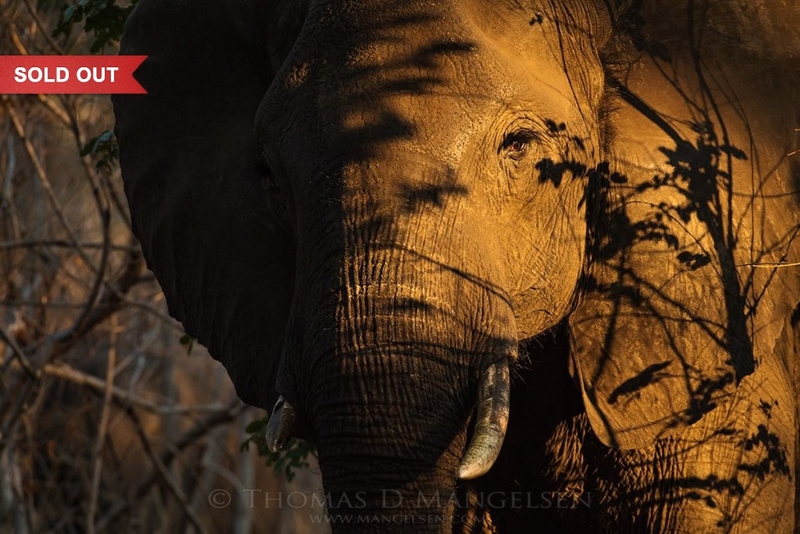 Now is the time to own a highly sought after Mangelsen fine art photograph and make a difference by helping to save the wild. All fine art photographs in Mangelsen’s Saving the Wild Collection are 30×45 inch Fuji Crystal Archive prints, framed using NatureView Anti-Reflective Glass and quality moulding in the latest designer styles. Each print is assigned a unique number (1 to 5), and hand-signed by Thomas D. Mangelsen. To acquire a rare image from the Saving the Wild Collection, email Customer Support or contact an Art Consultant. 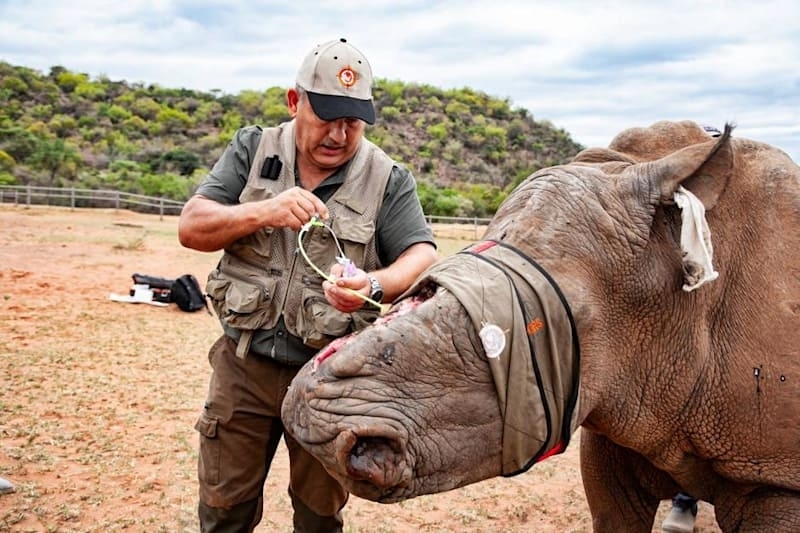 Image from Saving the Survivors | Dr Johan Marais, founder of Saving the Survivors, attends to a brave rhino who refuses to die. Premiering August 18th, and running until September 6, BBC Worldwide will present a 22 minute documentary; ‘Rhinos: Killing and Corruption’, featuring Saving the Wild’s courageous pursuit for justice. 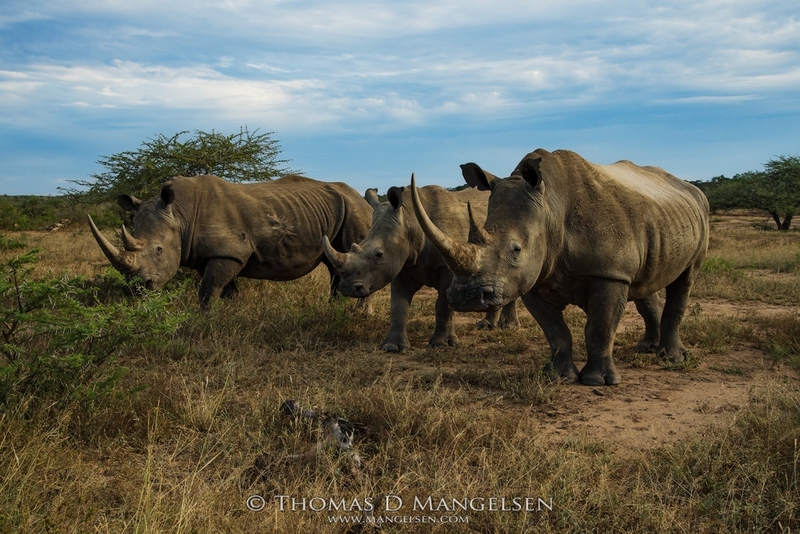 Mangelsen art collectors are now directly contributing towards the survival of the iconic rhino. By acquiring a rare edition from the Saving the Wild Collection you support the survival of Africa’s most endangered species making it possible to end corruption and change the course of their destruction. I would like to thank my collectors who have acquired a rare photograph from my Saving the Wild Collection. You have directly contributed to last week's arrest of "allegedly" one of the three major rhino poaching kingpins in South Africa. Read the press release on Saving the Wild with many thanks to all the unsung heroes. 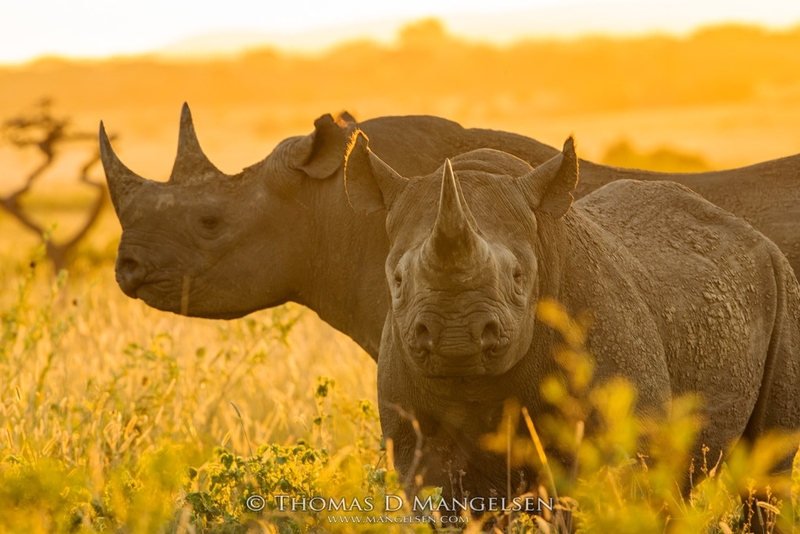 Saving the Wild is the only environmental organization based in South Africa whose mandate is to pursue high level targets and expose the corruption driving our precious rhinos into extinction- and yet it is the game changer! Together, we can all keep ‘Saving the Wild‘. Thank you. 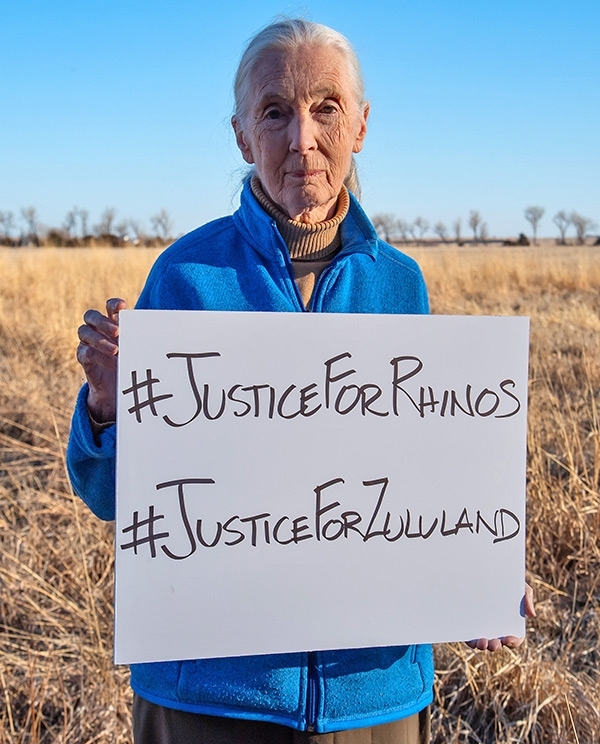 April 19, BBC Alastair Leithead reports: Entrepreneur Sir Richard Branson and conservationist Dr. Jane Goodall have joined a list of famous names who have signed an open letter to South Africa's government calling for an end to rhino poaching. The black rhino in the crosshairs is the son of the rhino standing at a 90-degree angle to her offspring. There is a very close emotional bond between mother and calf before they set off on their own at around three years of age. However, this calf was known to be particularly protective of mom, and closer to five years old, he had already fought a few battles for her and tended to stay close to her side. He was keenly alert to the click-click of my camera, and mock charged the vehicle to get an extreme close-up look at us, before deciding it was alright that we hung out with them. 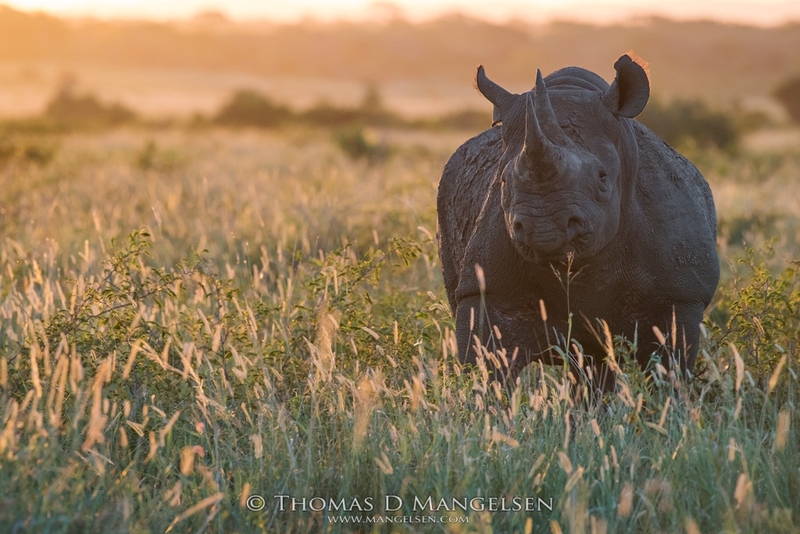 After the initial charge, there was a switch from anxiousness to curiosity, and they seemed to enjoy our presence throughout the golden hour as the sun set down it’s fleeting glow across the Zululand marsh. When I came across this black rhino he was staring down at a submissive warthog perched at the rim of a wallowing hole, in what appeared to be a moment of curiosity between the cute and the colossal. Suddenly something in the air caught his interest - the scent of a female - and he swiftly turned his attention away from this small creature at his feet, and bolted through the water as red-billed oxpeckers flew off his back. He charged straight past me, and into the thickets where the female was resting. Rhinos are impervious to almost anything but a poacher’s bullet, with skin like armor, and prehistoric horns. 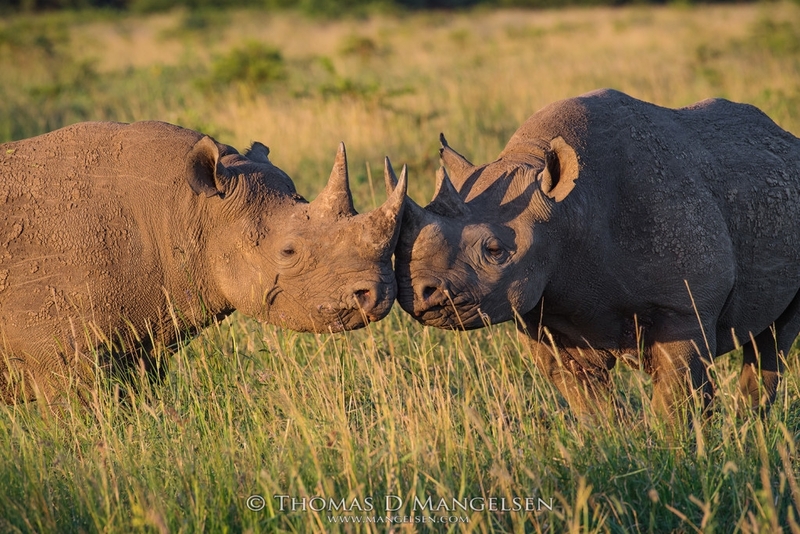 But rhinos have a tenderness to them that softens their battle persona and tugs on the human heartstrings when one is lucky enough to see two rhinos greeting each other in a moment of intimacy. The bull strides towards the west, stopping to breathe in the wild air of the land. He turns parallel to our vehicle as I suddenly feel the flux of history. From his two horns to the high tip of his spine, the black rhino’s imposing profile assaults the senses like nothing else on earth. It is our duty as guardians of the natural world to ensure rhinos don’t end up in a museum with the dinosaurs. These prehistoric mega-herbivores are the last living descendant of a lifetime 50 million years ago. If we lose the rhinoceros, we are amputating pieces of our own humanity. Due to horrific poaching, there are now less than 5000 black rhinos lefts in the wild. And so we fight. We fight for every breath. Backlight creates a dramatic scene as the long grass transforms from wheat to gold and a rising sun splashes across the commanding black rhino in a delicate dance of light and texture. My eyes were drawn towards all the finer details of the iconic species; the mud that cakes his prehistoric skin, his soft herbivore mouth, and the hairs that stand on the edge of his ears. Rhinos have excellent hearing and smell that make up for their poor eye sight, and spending time in the wild with the extraordinary and vanishing black rhino is an experience that will mark me deeply forever. Hluhluwe-iMfolozi Park (HiP) in Zululand, once a global conservation success story for bringing the southern white rhino population back from the brink of extinction in the fifties, has now become a graveyard for rhino carcasses, with massacres executed regularly. In 2017, the KwaZulu-Natal (KZN) province suffered a record loss of 222 rhinos butchered for their horns, most of them in HiP. 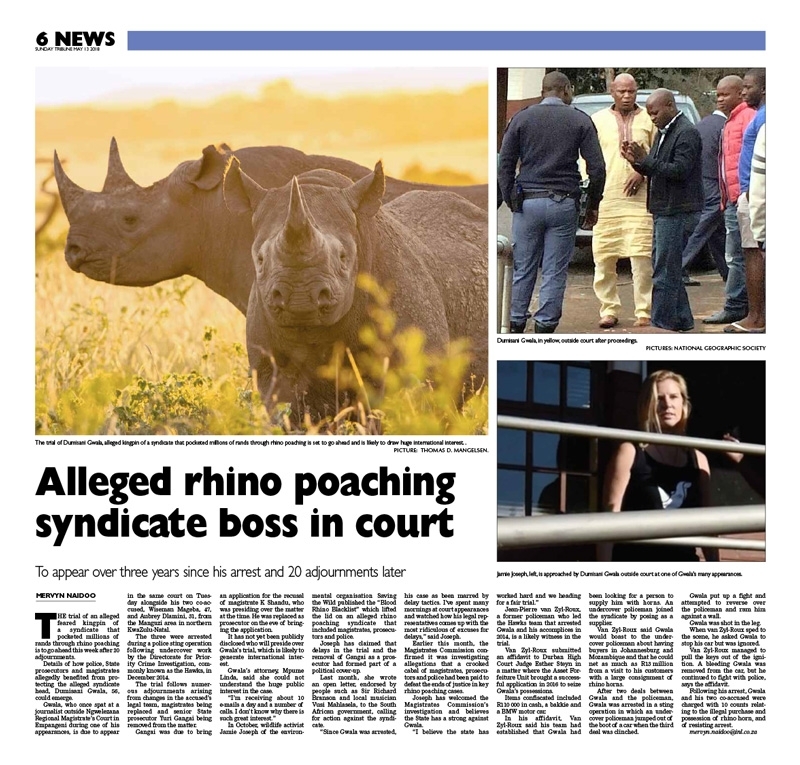 But Saving the Wild is fighting back, the only non profit whose mandate is to expose and eradicate the corruption enabling rhino poaching, they have systematically dismantled the Gwala syndicate headed up by Zululand’s accused rhino poaching kingpin, Dumisani Gwala. And in April 2018 they succeeded in a call for action to be taken against their ‘Blood Rhino Blacklist’; an alleged syndicate of judges, magistrates and lawyers protecting rhino poachers. In 2017, Zululand lost 222 rhinos to poaching, and most of them were butchered in the flagship Hluhluwe iMfolozi Park, where this photo was taken. 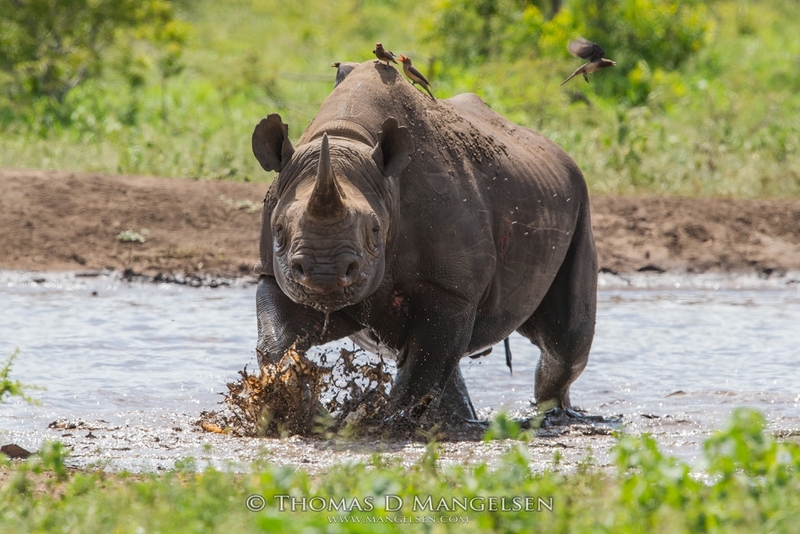 We are now in a race against extinction, where more rhinos are dying than being born. Something just surviving is the glory. 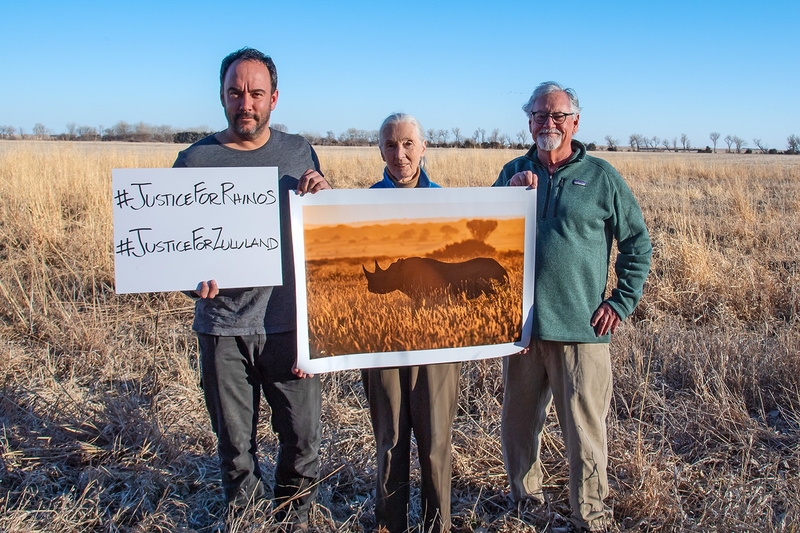 This is more than just a photograph; it represents thousands of dollars that will make a significant difference in the lives of these three rhinos, with half of all proceeds going to the groundbreaking environmental organization, Saving the Wild. She is the quintessential leopard; elusive, stealth and sublimely beautiful. I think she is the most beautiful leopard I have ever laid eyes on, and it was her eyes that stole the show that day. 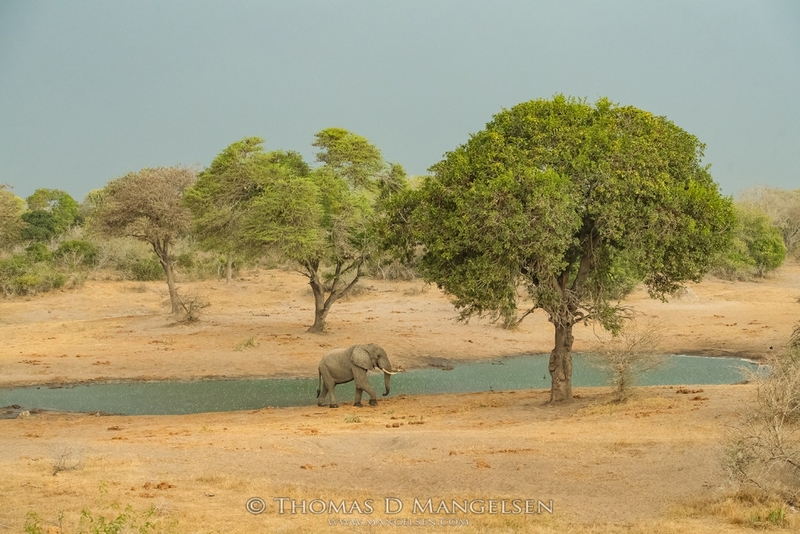 We found her resting in a marula tree, and perfectly at ease with our presence down below. Suddenly she jolted upright, surveyed the land before her, and ran down the tree and into the bushes. It took us humans a little while to catch up; lions were on the prowl, coming over the boulders and across the riverbed in her direction. But it wasn’t her own safety she was most concerned with. Her head kept darting in the opposite direction, in the direction of a den where she was hiding her young cubs. She was poised to create a distraction and lead the enemy away from her offspring. Then a fish eagle flew above us as she lifted her head to the sky. The sun lit up her spellbinding turquoise eyes, and in that moment, the world stood still. 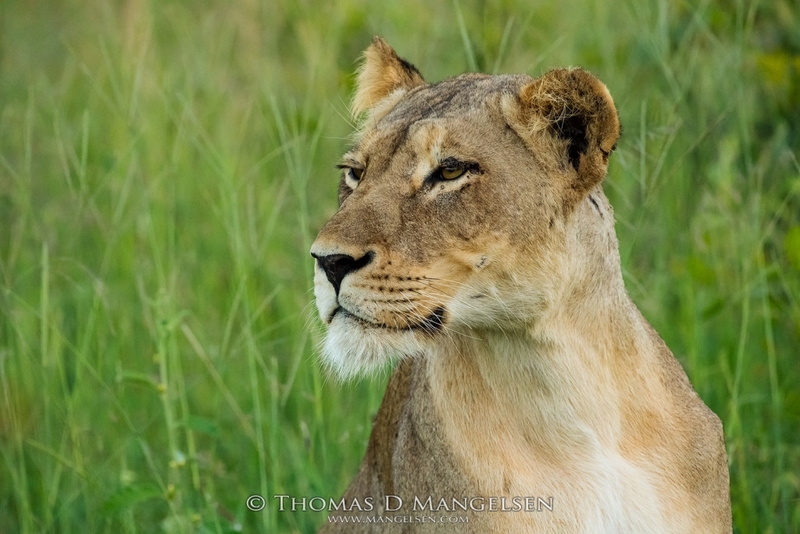 In the fading light and long green grass, this lioness casts her eyes from east to west, her mind turning with thoughts of a feast to feed her family, and which way she might head first as she leads her pride into the evening hunt. There is a quiet assertiveness about her, a certainty that she will go to great lengths to protect and provide for that which she holds most dear. Their mother, ‘The Huntress’, has set off on her evening hunt, leaving these mischievous cubs behind with one of the aunties, until she returns with food. The cubs pass time by playing with each other, tumbling under an orange streaked sky, and every now and then looking curiously in the direction of these strange humans who are watching them. Soon they will be old enough to hunt with mom. 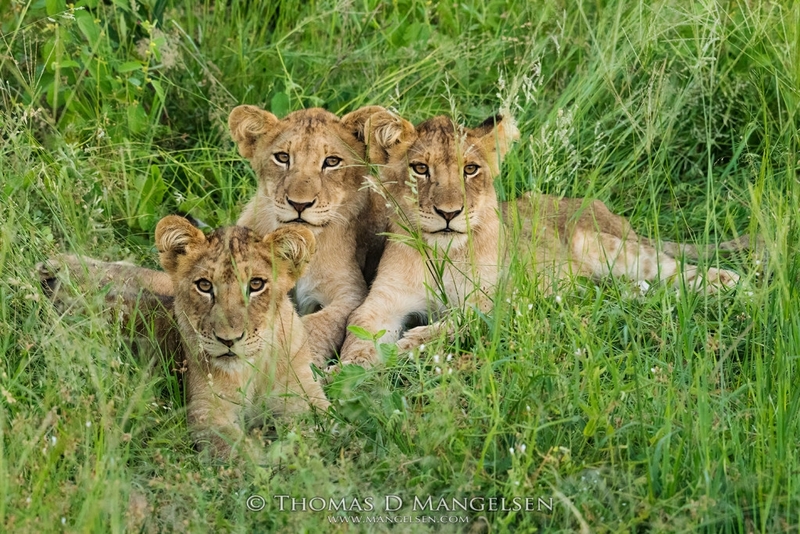 Mother lion starts teaching their cubs to hunt when they are around three months old, and by two years of age they need to be proficient at killing prey. 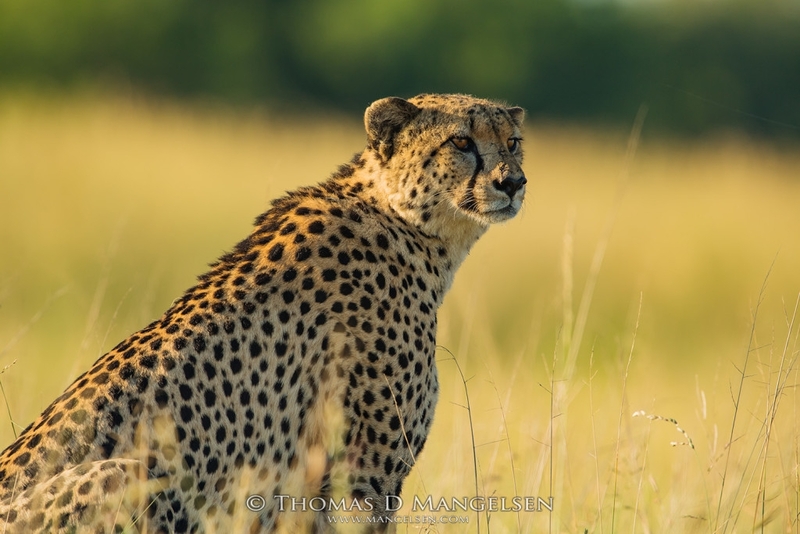 &Beyond Phinda Private Game Reserve is renowned for some of the best cheetah sightings in Africa. We followed this handsome male as he rose to his morning hunt, gracefully weaving through the long grass in his mission to find prey. The fastest cat in the world, there is estimated to be less than 10 000 cheetahs left in the wild. Fortunately, Phinda are pioneers in research and conservation. Since 1992, the reserve has seen more than 200 cubs born. As a result of this healthy increase in the cheetah population, by 2018 at least 75 animals had been relocated to other reserves in order to boost populations and diversify bloodlines. We came across an enigmatic matriarch just as the sun was rising. She watched us curiously for a long time, revealing her beauty with every step as she slowly moved closer towards us through the thickets. Morning shadows danced gracefully across the canvas of her body, and I was reminded once again that the greatest artist on earth is nature. A crowded landscape of green and gold teakwood shimmer in the midday heat. I watched at least 100 elephants come and go as several different families took their turns to drink from the well of life. Elephants are highly intelligent, they have excellent memories, and are acutely in tune with their surroundings. 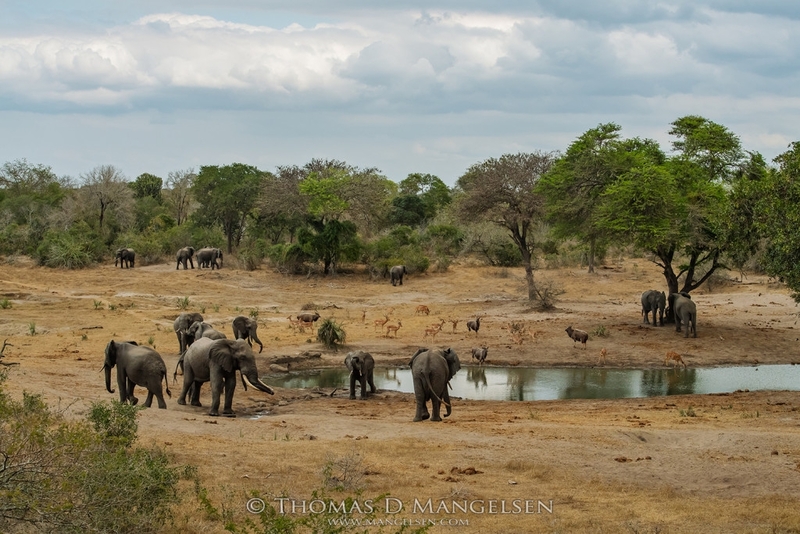 They have the knowledge of pathways, and safe places, such as this waterhole found in the Ivory Lodge concession in Hwange, home to some of the biggest elephant herds in Africa. It's always fascinating watching elephant behavior. At Tembe hide we watched the younger ones hang back, up on the hill, and wait their turn to go down to the waterhole and drink, so it never got too busy. And the old bull on the left, with huge, beautifully curved tusks, well he could do whatever he wanted. We watched elephants sparring, and others just chilling, or kicking up a little dust. We watched them quench their thirst, and spray the sky like a firehose. We watched them plunge into the water, and shake their heads with delight. We watched the nyala and impala drink from the same well, and we listened to the chatter of birds and felt the breeze on our cheeks. We felt things only Africa can make you feel. 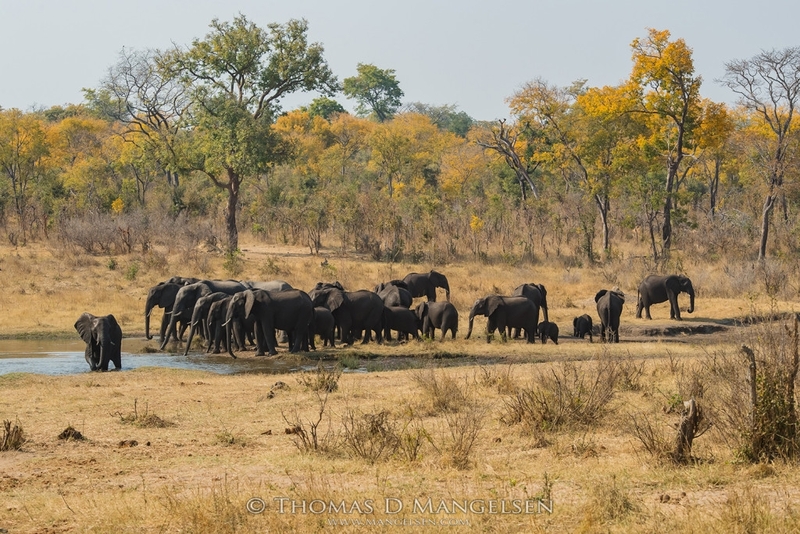 It was my fourth and final day at the waterhole, and I was captivated by the flow of activity. Suddenly there was a rumble in the sky, and the animals all vanished. The rain was coming... Lightning struck, bolts twenty seconds apart, and I wondered who would be first to return as the rain began to fall. Who would have the watering hole all to himself, who would be king of the storm? Nine minutes later a grand bull appeared; head up, shoulders back, a confident stride as rain drummed on his back. It was the dry season in Hwange. Every waterhole becomes an oasis, a lifeblood for all species. As the sun headed toward the horizon, great herds of buffalo started moving from the grasslands, through the woodlands, and into the valley where they would find remnants of water. In the final 300 yards, they began to stampede in their urgency to quench their thirst, backlit by a fireball sun. To acquire a rare image from the Saving the Wild Collection, email Customer Support or or contact an Art Consultant. 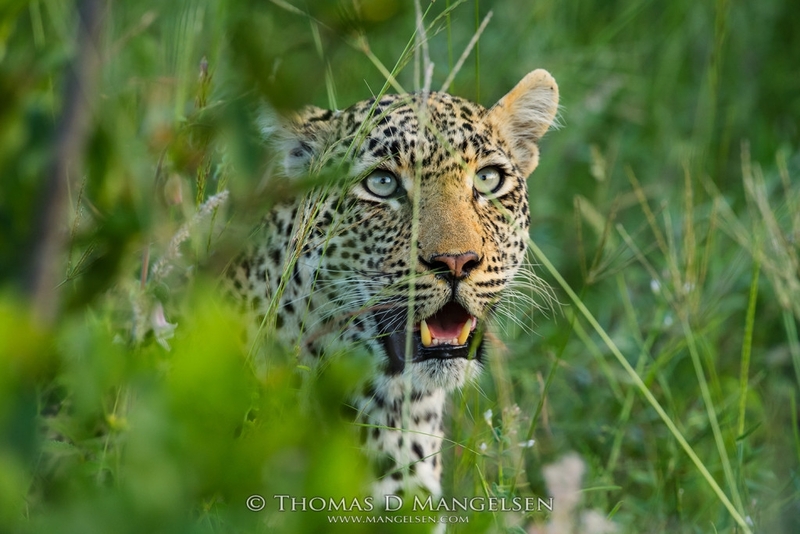 Mangelsen is as much a conservationist as he is a photographer. Watch as Anderson Cooper talks with Tom about both during the 60 Minute segment Into the Wild.